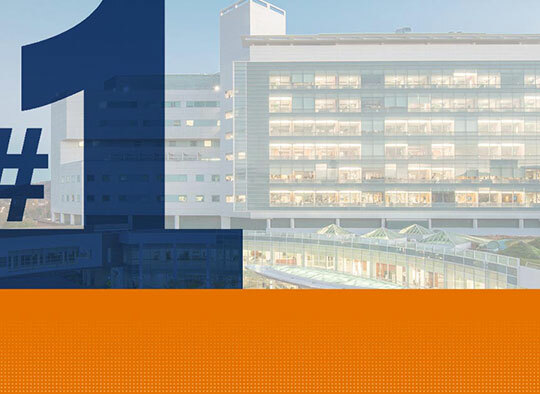 University of Virginia Medical Center ranked No. 1 hospital in Virginia. For the third consecutive year, U.S. News & World Report has ranked University of Virginia Medical Center as the No. 1 hospital in Virginia. The publication’s 2018-2019 “Best Hospitals” guide also recognizes nine UVA specialties for adults among the best in the U.S.
UVA is also rated “high performing” – the best possible rating – in eight common procedures or conditions: abdominal aortic aneurysm repair, aortic valve surgery, heart bypass surgery, heart failure, colon cancer surgery, hip replacement, knee replacement and lung cancer surgery. These ratings are generally based on care provided to inpatients ages 65 and older. “These national honors showcase the wide range of high-quality, specialized care that our physicians and team members provide to patients from across Virginia and beyond,” said Pamela M. Sutton-Wallace, chief executive officer of UVA Medical Center. U.S. News bases its rankings and ratings on factors that include patient safety, patient outcomes, advanced technologies, patient services, physician surveys and accreditations from outside groups such as the National Cancer Institute (NCI) and Magnet recognition for nursing care from the American Nurses Credentialing Center. UVA has earned Magnet recognition and is one of 70 NCI-designated cancer centers nationally. “These honors highlight the daily efforts of team members across UVA Health System to discover new and better ways to provide the best care to our patients,” said Richard P. Shannon, MD, executive vice president for health affairs at UVA. Earlier this year, U.S. News recognized UVA Children’s Hospital in its 2018-2019 “Best Children’s Hospitals” guide. Six specialties at UVA – neonatology, pediatric diabetes & endocrinology, pediatric neurology & neurosurgery, pediatric cardiology & heart surgery, pediatric urology and pediatric gastroenterology & GI surgery – were rated in the top 50 nationally.